Shop tiger eye rings made from natural & genuine tiger eye gemstones. About Tiger Eye Tiger eye helps you stay centered and calmly practical despite the ups and downs of life. It helps you balance polarities and accept contradictions, taking life as it comes and responding to the needs of the moment without judgment. It is a helpful stone for protracted difficult situations, as it lends endurance and keeps you in the best state of mind to deal with problems as they come without getting overwhelmed, hopeless, or reactionary. Visit Tiger Eye Meaning & Properties for more about the benefits of tiger eye. Red Tiger's Eye Gemstone Cabochon Sterling Silver Wire Wrapped Ring - Made to Order and Ships Fast! Green Tiger's Eye Gemstone Cabochon Sterling Silver Wire Wrapped Ring - Made to Order and Ships Fast! Golden Tigers Eye Gemstone Cabochon Sterling Silver Wire Wrapped Ring - Made to Order and Ships Fast! Blue Tigers Eye Bali Gemstone Sterling Silver Wire Wrapped Bead Ring - Made to Order, Ships Fast! Golden Tigers Eye Faceted Bali Gemstone Sterling Silver Wire Wrapped Bead Ring - Made to Order, Ships Fast! 925 sterling silver Tiger eye ring, size 7.75 US or T 56: beautiful stone of protection, ideal for the Empath. Macrame Jewelry Tigers Eye Natural Stone Ring. 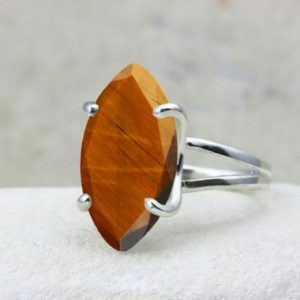 One Of A Kind Spiritual Ring, Unique Gift For Her. 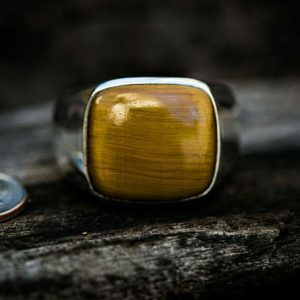 Mens Tiger's eye ring. Boyfriend gift. Crystal Reiki jewelry. Capricorn jewelry. 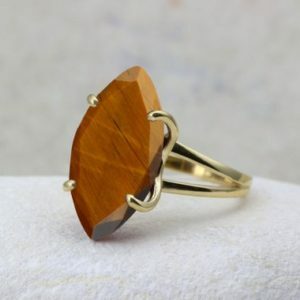 Brown gemstone adjustable ring. 925 sterling silver. Tigereye copper ring, Tigereye ring, Tigereye brass ring, Ring copper tigereye, Copper tigereye ring, Oval cabochon tigereye ring. Honey Tiger's Eye Bali Sterling Silver Wire Wrapped Gemstone Bead Ring - Made to Order, Ships Fast! Blue & Golden Tigers Eye Gemstone Sterling Silver Wire Wrapped Bead Ring - Made to Order, Ships Fast! 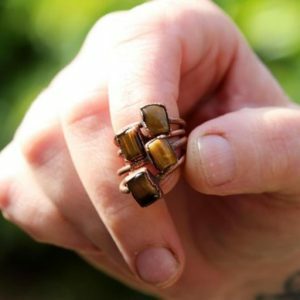 Thank you for shopping for Tiger Eye Rings! Tiger Eye healing properties include: anger & stress relief, anxiety & depression, clarity & focus, grounding, hope, vitality, wisdom. 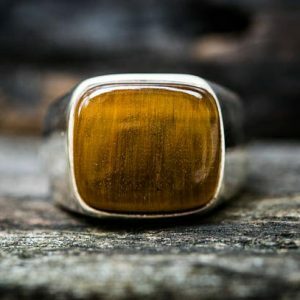 We have scoured Etsy to find the best genuine tiger eye rings. We look for handcrafted & handmade, unique, OOAK, & high quality natural gemstones.